Groups claiming loyalty to the Islamic State in Iraq and al Sham (ISIS) are emerging throughout Yemen. It is unknown whether these pro-ISIS groups have ties to ISIS in Iraq and whether they operate together or independently. The groups call themselves wilayats (provinces) following standard ISIS practice. There are seven known wilayats operating in ten Yemeni provinces: Sa’ada, Sana’a, al Jawf, al Bayda, Taiz, Ibb, Lahij, Aden, Shabwah, and Hadramawt. Yemeni pro-ISIS groups have mounted attacks against the al Houthis, al Houthi allies, and the divided Yemeni military over the past three months. Pro-ISIS groups are framing their attacks as part of a broader Sunni-Shi’a conflict and are specifically targeting Zaydi Shi’a al Houthis. The groups seek to exploit festering local grievances with the al Houthis for recruitment and appear to be trying to subvert al Qaeda in the Arabian Peninsula’s (AQAP) self-proclaimed role as protector of the Sunni people. Wilayat Sana’a, a pro-ISIS group located in Yemen’s capital, conducted five coordinated suicide vest (SVEST) attacks on March 20 in Sana’a and Sa’ada targeting Zaydi Shi’a mosques and killing over 137 people. Wilayat Sana’a later released operational details of the attack and identified the bombers, many of whom were from Yemen’s central Ibb province. Several media outlets indicated that the SVEST attacks were ISIS’s first military operation in Yemen, but pro-ISIS fighters executed an earlier attack in al Jawf province, northeast of Sana’a on February 28, firing mortar shells at al Houthi fighters manning the Safir checkpoint in Ma’rib. It is unknown whether these militants are members of Wilayat Sana’a or a different pro-ISIS group. There are four pro-ISIS groups operating in south central Yemen: Wilayat Aden, Wilayat Lahij, Wilayat Green Brigade (Ibb and Taiz), and Wilayat al Bayda. Wilayat Aden beheaded five al Houthi militants between March 26 and March 29 and attacked an al Houthi patrol on April 7. Wilayat Lahij temporarily seized a city and executed 29 Yemeni soldiers on March 20 and conducted other attacks throughout March. Wilayat Lahij has an unidentified emir and deputy emir leading its operations, which indicates that the pro-ISIS group has a chain of command. It is unknown whether other pro-ISIS groups have a similar command structure. Both Wilayat Lahij and Wilayat Aden have released similar political statements, highlighting ISIS’s desire to protect Sunnis and recruit Muslims for its struggle. Wilayat Green Brigade, operating in Ibb and Taiz, detonated an improvised explosive device (IED) near an al Houthi patrol on April 22 in Ibb. Wilayat al Bayda beheaded an al Houthi militant on March 31. There are three pro-ISIS units operating in eastern Yemen: Wilayat Shabwah, Wilayat Ataq, and Wilayat Hadramawt. Wilayat Shabwah fired mortar shells at an al Houthi gathering on April 23, and its media office recently produced a propaganda video of Wilayat Ataq militants beheading and executing 15 Yemeni soldiers on April 14 and April 15. Its shari’a committee also released a statement calling for Muslims to pledge allegiance to ISIS leader Abu Bakr al Baghdadi. All three groups have released analogous political statements at similar times, indicating a possible level of coordination between Wilayats Aden, Lahij, and Hadramawt. Yemeni pro-ISIS groups will likely continue to expand their influence and areas of operation as long as they can exploit the current security vacuum. The extent of the pro-ISIS groups’ expansion is not only contingent upon the result of the ongoing conflict between the Saudi Arabia-led coalition and the al Houthis, but also the interests of their main competitor, AQAP. AQAP has not visibly halted the expansion of pro-ISIS groups outside of questioning some of their provocative operations and denying any role in these operations. 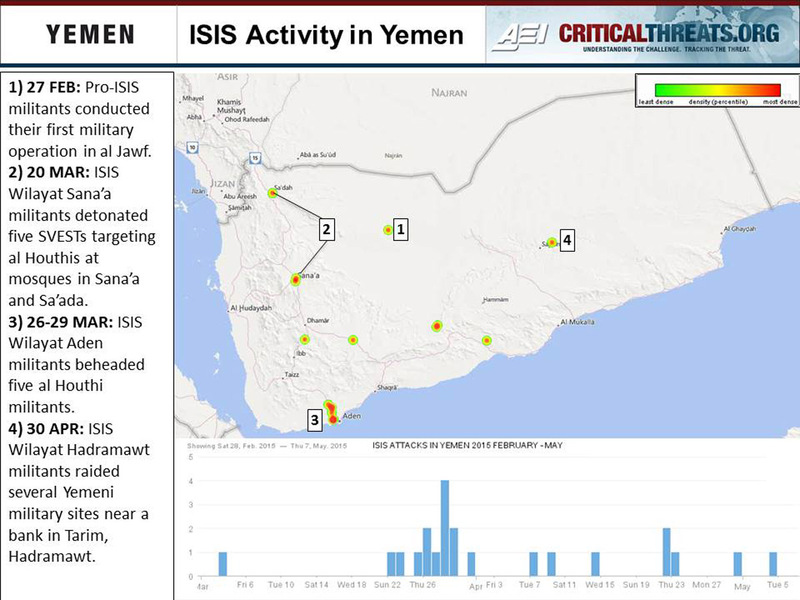 The Saudi air campaign has also not struck any known pro-ISIS locations in Yemen to date, making the al Houthis, the Yemeni military, and select Yemeni tribes the only active deterrents to the expansion of pro-ISIS groups. Pro-ISIS groups will likely remain a growing threat in Yemen until local and international actors devote more resources to halting their expansion and curbing their appeal to disenfranchised Sunni populations. Dan O’Keefe contributed to the research for this piece.